The start-up support programme Adlershof Founder’s Lab has been active for a year now. The programme fosters technical and technology-based team start-ups on campus. Time to look back. The head of sales needs company-wide sales figures. Not in three days, but today. Not once a month, but every day. Most often, several employees is busy compiling PDF documents and mailing them to their boss ‘asap’. ‘This takes a lot of time that could be better used,’ claim Khanh Tuong and Carsten Meyer, the founders of Kiwi Intelligence UG. The start-up has developed a software that delivers the right data to the right people at the right time – automatically to a large extent. ‘This supports executives in making good decisions,’ says Tuong. The two founders also made a good decision by moving into the Adlershof Founder’s Lab. ‘For people who are just starting out, the conditions here are excellent,’ says Tuong. 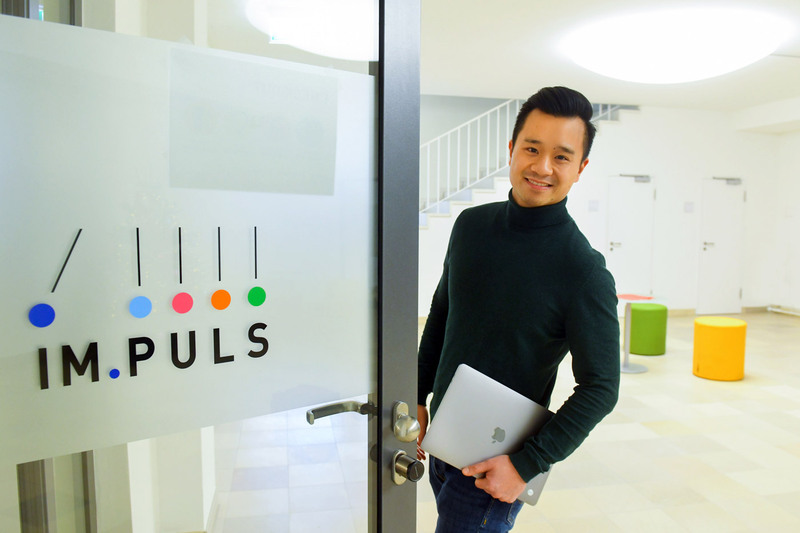 In addition to a grant of 1,500 euros a month and a free-of-charge dedicated desk, including all the relevant infrastructure, at the in-house co-working space IM.PULS, Adlershof Founder’s Lab scholars get valuable knowledge virtually for free: ‘The workshops and coaching are done by practitioners who are well-connected with the business scene. They’re incredibly helpful,’ says Tuong. Further, the programme offers mentoring services in the technology fields such as photovoltaics, renewable energies, photonics, optics, biotechnology, environmental technology, microsystems, materials, IT, and media, says Tobias Kirschnick, head of Adlershof Founder’s Lab, as well as coaching on issues like funding and team building. Kirschnick, who launched his own start-up, is always on hand with help and advice for the founders. ‘However, we try not to overload people with workshops and information events. After all, the founders are meant to work on their ideas as independently as possible.” Moreover, Kirschnick’s experience is that networks, mutual support, and contacts to mentors usually come about on their own accord. Looking back on the first year of Adlershof Founder’s Lab, his message was positive: ‘It looks like all the companies in the programme will survive. Our concept has worked.’ He is particularly glad that young Adlershof-based companies from very different areas were able to grow together at Adlershof Founder’s Lab: from printing technology to water conditioning, or satellite communication, many different fields are represented. Overall, 32 business founders across 14 start-ups are being supported with funds appropriated by the European Social Fund (ESF) and Berlin’s Senate for Economics. Among them are Florian Herrmann and Uwe Lebelt. The founders and heads of Auxolar GmbH had already been residents of the Centre for Renewable Energies and Photovoltaics (ZPV) in Adlershof but wanted to use the Adlershof Founder’s Lab to improve and expand on their business idea. Auxolar integrates solar collectors in multi-family homes to advance decentral energy supply and, at the same time, reduce utility costs for the tenants by enabling them to produce and consume their own sun-powered energy. Herrmann rates the Adlershof Founder’s Lab highly for jumpstarting businesses: ‘First, it’s a financially attractive programme and, secondly, Adlershof as a technology location provides a range of potential partners and an excellent environment for our business.’ It is a very good place for making new contacts in technology and sales. ‘Communicating with other start-up teams is also very fruitful,’ emphasises Herrmann. There is ‘absolutely no doubt’ that the company will remain on the site after the Adlershof Founder’s Lab programme is completed.